Over a month ago, I wrote roughly on Bing's potential against Google. To carry on with the job, someone has come up with a neat website for those of you who are still in the verge deciding which way to go. This site called bing-vs-google.com lets you see your search results on one page. It uses both engines at one time. Actually, it makes your searches more efficient when you want to compare things on both. I've to be honest here, my 16:9 screen was far better to see results onto than my father's 4:3. Lets go to my own personal analysis. I tried couple of searches on certain keywords and Bing's were more accurate. Google simply outputted non-relevant results whereas Bing did the good job. Say, I started with my name(can click/see in the picture above) and I've to admit, Google didn't put my site on their radar. It's still showing the same old stuffs from it's cache. Ridiculous. With doubts I tried other keywords, say 'Nepal' and once again, Google showed totally irrelevant nonsense in it's third or fourth link. Checked back with the Bing, none was the case. 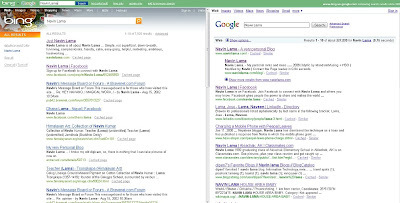 This is my second verdict on Google Vs Bing and here, Bing is still the winner. 1. Usually Google's third or fourth links are more useful than first or second. Paid ads are very different stories. I'm not talking about this blog, my ad free personal site, navinlama.com is still not on their updated list. Some times I dig into 25 pages underneath to find what I need on google. I've not yet tried it with Bing but I'm slowly changing my course. I have been a Google girl since the get. But with all the information I am reading about Bing, I am ready to see who wins out for myself.